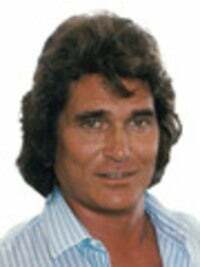 Well, it's been nearly two decades now, and I just have to laugh: I honestly never thought I'd be able to pull it off, but here we are in 2010, and everyone in the world continues to believe that I, Michael Landon, beloved star of American television, died in 1991. Heh. I guess I've done a pretty bang-up job faking my death so far, wouldn't you say? Shoot, I figured I'd be good at this whole pretending-to-be-dead thing, but not this good! The funny thing is, I haven't heard a single person insinuate that I might still be alive and well, living in New Mexico. I get such a kick out of that! You'd think somebody would have caught on by now, especially since I haven't exactly gone to any great lengths to conceal my identity. All it takes is a baseball cap, some eyeglasses, and this red jacket I picked up, and I can walk around anywhere. I can go grocery shopping, or sit in a café and watch the people go by uninterrupted. Jesus Christ, I even went to my pal Merlin Olsen's funeral back in March and not a soul recognized me! It was great. Now, I know what you're thinking: Why would Michael Landon, who has a star on the Hollywood Walk of Fame and who appeared on network TV almost every week for 30 years, ever want to fake his own death? It just doesn't make any sense, right? But see, that's the beauty of the whole deal—it makes absolutely no goddamn sense at all. It's a completely ridiculous concept; hence, no one suspects a thing. I remember when I first began noodling around with the idea of faking my own death back in the mid-'80s. You remember me then: Mr. Ingalls on Little House On The Prairie; Jonathan Smith on Highway To Heaven; all that junk. Anyway, I'm sitting in the Palm Restaurant in Los Angeles, and just out of the blue, I say to myself, "Hey, Mike, do you really want to be on TV Guide covers for the rest of your life, or do you want to live free and unencumbered and have a life of your own damn choosing?" Cut to four years later and I'm procuring a homeless man's corpse, disguising it in a wig made from years' worth of my own hair clippings, and going on The Tonight Show to ask everyone to pray for me. Man alive, when I re-watch that clip, I think, "Landon, that was the best performance you ever gave." And you know, staging your demise isn't anywhere near as hard as you might think. All you need to do is grease a few wheels down at the coroner's office with a couple signed Melissa Gilbert headshots, and you've got all the death certificates and autopsy reports you'll ever need, no questions asked. Then it's bing, bang, boom, next thing you know you're starting up that little landscaping business you've always wanted and finally learning how to fly-fish. Sure, the whole fake-death thing was hard on my family, but they got through it. Plus, it was so moving to watch all the tributes and Bonanza marathons, and to read all the obituaries lauding my noble spirit. Yes, sir, America was pretty torn up after they thought I had died. That was pretty cool to see. But that's all ancient history. I've got a new family and a new life now. Me and my girl, Ling, have our own little place outside Santa Fe, and my business is doing great. Michael Landon's Landscaping, I call it. It's nothing fancy, but it's good, honest work that makes a man feel whole. It's a nice life I've got. A little gardening in the morning, do the crossword over lunch, maybe swing the wrenches down at the driving range with Jim Henson or John Denver, and then top the day off with an evening cocktail or three. Not too bad, if I do say so myself. Not too bad at all. Anyway, I'd better get going, the little lady is expecting me back by dinner. But would you mind doing me a favor? Could you keep this fake-death conversation to yourself for a bit? Just for a few years, until I show up on the Little House 30-year reunion special and just absolutely blow everyone's mind.